10 day SMA of Trin Recovering from Oversold Levels(1.7) with showing some rise in the markets. 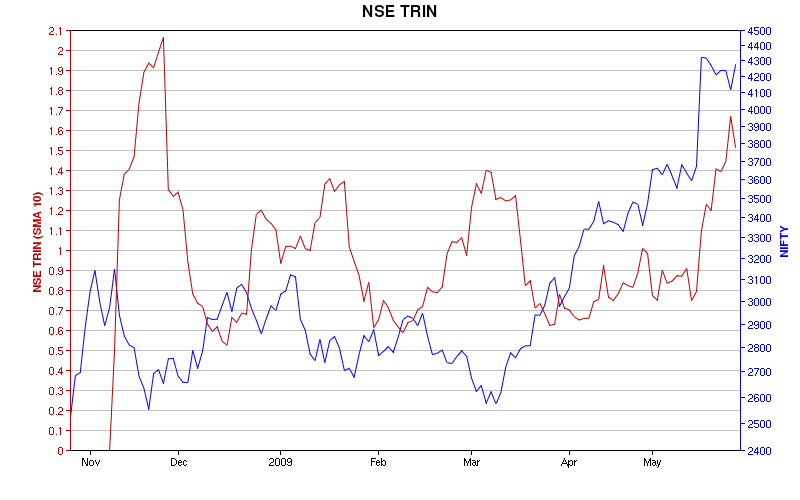 Now trin is targetting towards the value 1 with rising markets in short term. But 10 day SMA of Trin dipping below 1 is considered to be a buying oppurtunity in our markets until then wait for 10 day SMA of TRIN to dip below 1. Until then liquidate your profits in every rise and and stay with cash. rajandran how do i calculate ad ratio and trin for nifty. how do i make it in excel. could u please guide n help.